VIZIO SB36512-F6 Sound bar system for home theater 5.1.2-channel Bluetooth, Wi-Fi - BlackPremium VIZIO sound system with Dolby Atmos elevates home entertainment to new heights with dedicated built-in upward-firing speakers to deliver powerful dome of dynamic sound that envelops you from every direction, even from above. Engineered to delight cinephiles and audiophiles with multiple strategically placed and dedicated channels to deliver crystal-clear dialog, powerful bass and rear surround sound speakers to create truly immersive surround sound. Premium VIZIO sound system with Dolby Atmos elevates home entertainment to new heights with dedicated built-in upward-firing speakers to deliver powerful dome of dynamic sound that envelops you from every direction, even from above. 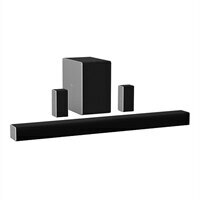 Engineered to delight cinephiles and audiophiles with multiple strategically placed and dedicated channels to deliver crystal-clear dialog, powerful bass and rear surround sound speakers to create truly immersive surround sound.